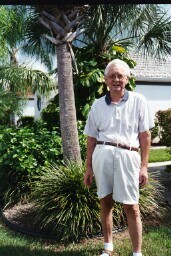 Joe outside his home in Venice, Florida in 2002. Photo by Christy Packard. Joseph was born March 2, 1931, in Buckeye Lake, to Edward and Georgetta (Woodruff) Huber. He passed away March 12, 2008, in Venice, Fla. He also lived in Heath, Ohio. Joseph worked for more than 30 years and retired from Owens Corning. Joseph is survived by nephew, Ronald Bowman, of Venice, Fla.; and niece, Sandra Downs, of Newark. In addition to his parents, he was preceded in death by his wife, Phyllis. Huber was a member of the North American Bluebird Society. He designed the Huber inbox Sparrow Trap - see http://audubon-omaha.org/bbbox/nestbox/huber.htm and also the Bluebird Monitor's Guide, pages 83 and 120. This trap uses a metal plate that drops down over the entrance hole of a nestbox when tripped. Christy Packard said that Joe used to say "just put a box out at any time - like now - and see what happens." She said "I thank Joe for always supporting me with his positive thoughts and knowledge." We are like dwarfs on the shoulders of giants, so that we can see more than they, and things at a greater distance, not by virtue of any sharpness on sight on our part, or any physical distinction, but because we are carried high and raised up by their giant size.